Aamir Khan celebrated Eid al-Adha day with Kiran Rao, Fatima Sana Sheikh, Sanya Malhotra, Ashwiny Iyer Tiwari and Nitesh Tiwari. On this auspicious day this bunch of cool people were glowing with joy. 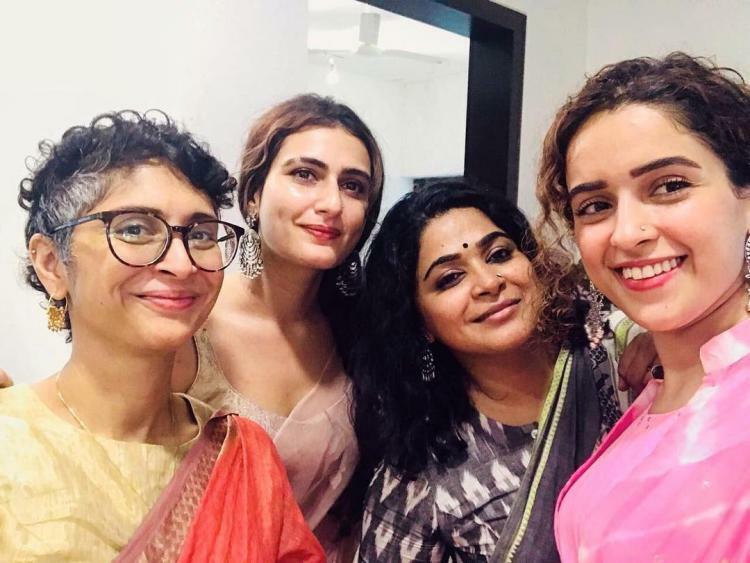 All the ladies in the celebration, Fatima Sana Sheikh, Kiran Rao, Sanya Malhotra and Ashwini Iyer spent some happy and joyous moments on Eid together. The ladies in Eid were seen in celebrating the day on traditional wear. Kiran Rao was seen wearing an orange sari paired with a gold blouse. Sanya Malhotra celebrated wearing this beautiful with and amazing earring which I want too. Fatima Sana Sheikh wore a pretty blush pink sari. Ashwini Iyer Tiwari, the director of ‘Bareily Ki Barfi’ and Also Nitesh Tiwari’s wife wore black khaadi saari. All these pretty ladies in eutiful attire is giving some serious fashion goals. Also, it is beautiful and very heart-warming to see the whole Dangal team together with their extended family as well. Aamir Khan, his wife Kiran Rao, Nitesh Tiwari and his wife, Ashwinin Iyer Tiwari comes together to celebrate this festive season and we can’t ask for more. Fatima and Sanya are pretty tight with their bonding and time and again, we get to see how beautifully the whole Dangal team bond with each other. Fatima and Sanya recently travelled together to Ukraine and shared a lot of fun pictures. On the work front, Fatima Sana Sheikh is working with Aamir again on ‘Thugs of Hindostan’ while Sanya Malhotra is ready with her next, ‘Patakha’ is releasing next month on 28th September. Also, Ashwini Iyer Tiwari have announced her new venture, she is now going to work with Kangana Ranaut on a film titled Panga. The movie will also star Punjabi actor, Jassie Gill and Neena Gupta in pivotal roles.